Abstract: Ming Tsao’s music theatre work Prosperos Garten is based on Shakespeare’s The Tempest and deals with colonial power relations as created and consolidated through language, and through associated elements of abstraction. Tsao realizes this language-critical interpretation of The Tempest with an aesthetic that, through reverse transcriptions of pre-existing historical material and complex structural sounds, integrates dissociated musical fragments, and thus also fragments of music-cultural perceptions, into the composition, interweaving them and bringing them into contact through layers of different sonic contexts. In this manner, he strives to open up possibilities for polyphonic musical subjectivity and expressivity beyond dichotomous representations. “What is Speculative Music Composition?” in PARSE Journal #7, Speculation Issue, 2017: 45–62. Abstract: One of the challenges of contemporary music composition is to speculate upon “possible worlds” as a counterpoint to our contemporary understanding of place, where the lyrical impulse in music is sensitive to relations between human impact and presence in the more-than-human world. Such sensitivity arises from a compositional superfluity where subjectivity is “dislocated presence” for new modes of perception to appear that resist representation, conceptualisation, enframing, quantification and instrumentalisation. Music composition today should ask listeners to listen beyond anthropocentric terms, including the ways in which the resistance of the world—its conflicting and dynamic materiality—exceeds both conceptual thought and technological control. This “speculative turn” in music composition is indeed not to excise music’s resemblance to language, and by extension music’s capacity for expression, but to decentre music’s humanised expression from its privileged position for the possibility of a music independent of from language, thought and intentions, where music’s materiality can exceed human agency. Such music would suggest a critical materialist sound—a sound world outside of consciousness rather than a sound world fully endowed with consciousness, thus placing the listener in a space where they are required to rethink their personhood within a larger domain of life. “Helmut Lachenmann’s ‘Sound Types’” in Perspectives of New Music, Volume 52, Number 1 (Winter 2014): 217–238. “Resistance and Difficulty” in New Music and Aesthetics in the 21stCentury Volume 9 (Summer 2014: 173–194). “Mein Shakespeare-Moment” in A Party for Will! A Journey into the Shakespeare Universe (edited by Petra Hesse and Peter W. Marx), Cologne: Theater der Zeit, 2014: 195. 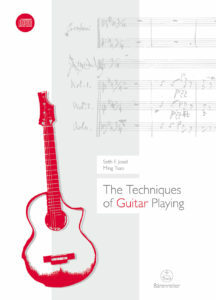 Abstract: This book by pioneering guitarist Seth F. Josel with composer Ming Tsao is dedicated to the presentation and explanation of contemporary guitar techniques. Relying on extensive use of tables, charts and musical examples as well as an accompanying CD, various novel techniques ranging form multiphonics to percussive actions are discussed in detail, including the analysis of salient passages from the literature of the 20th and 21st century. What is unique about this book is the historical contextualization of each technique along with discussions around the orchestration of the guitar in chamber and orchestral musical settings. Abstract: This book is an introduction to GIS (Generalized Interval Systems) theory that includes the major results of pitch-class theory. 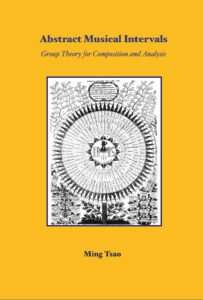 It provides mathematicians with applications of group theory to music and music theorists with the essential connections between GIS theory and pitch-class theory. Many of the results in pitch-class theory are not addressed by David Lewin (such as power functions or the Common Tone Theorem for inversions). The book states those results and generalizes them to conform with GIS theory. Finally, it addresses recent criticisms leveled at pitch-class theory and suggests how they can be addressed in GIS theory.